Once upon a time there was a mama who loved her babies, cloth diapers, and sewing (yes, it's me). I decided to combine those three loves, and Zany Zebra Designs was born. There's much more to the story, but that's the important part for now. Fast forward 10+ years. My babies are teens, and although my love for cloth diapers and sewing is still there, I don't have enough hours in the day to do everything. So, with a heavy heart I decided to stop sewing cloth diapers. But rather than close Zany Zebra entirely, I'm going to keep the informational pages available. My new goal is to help new cloth diapering mamas learn about cloth diapers so they could learn to love them as much as I do. I hope you find the information you're looking for, and I also hope you enjoy all the ZZD cloth diaper photos. Most of these litte ones are teenagers now too! We love everything about cloth diapering and want to share our love with you! Sit back, grab your favorite drink and let us show you how wonderful cloth diapering can be. Unsure about cloth diapers? Let us show you why cloth diapering is far superior to disposable diapering! New to cloth diapering? Welcome to the wonderful world of cloth! We're so excited to help you get started in cloth diapering! 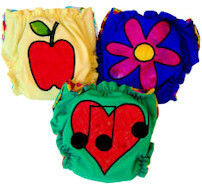 Want to learn more about cloth diapering? We've got the up-to-date articles you need! Thinking about sewing your own? We'll help you make a killer cloth diapering stash - cheaply and easily! It's OK if you're still not sure that cloth diapering is right for your family. Many new parents don't have any experience with cloth diapering and become overwhelmed with information. Take your time and do the research; we're sure that once you do you'll be convinced that cloth is the way to go! We've used both cloth and disposable diapers on our children and are more than happy to share our experiences with you. Feel free to contact us with any questions any time! Use this handy comparison chart by I Heart Budgets to compare the cost of cloth and disposable diapers. Discover why more and more families choose the cloth diapering side of the cloth vs disposables debate today! Welcome! We were new to cloth diapering once too, and know how overwhelming it can be. Don't despair, we'll help you discover how easy and fun cloth diapering can be. Feel free to contact us, we love to spread the cloth diapering love! Choose a system with Cloth Diapers 101. Learn about types of cloth diapers. Calculate how many cloth diapers you'll need based on the age of your child, how often you plan to do laundry, and other factors. Discover laundering tips and tricks to help keep your diapers looking and smelling fresh! Interested in "Do it Yourself" Cloth Diapering? If you're independent and like to do things yourself you'll enjoy making your own cloth diapering items! You'll be proud to show off your creations, and will save money too - what could be better than that? For you we've collected a ton of great cloth diapering resources to help you feed your independent streak. Have a ball creating cloth diapers, wipes, doublers, and everything else your cloth diapered little one will need! How to Applique leads you step by step so you can create your own appliques . Make Your Own Cloth Wipes is easy at a beginning, intermediate or experienced level. Make Your Own Wipe Solution and save money. Learn about the main ingredients in homemade wipes solutions and try each of the twenty recipes for homemade cloth wipes solutions. Free Cloth Diaper Patterns! provides patterns and directions to make almost everything you need for a complete cloth diapering system. Want to Learn More About Cloth Diapering? OK time to 'fess up. Are you one of those cloth diapering mamas who's totally obsessed with cloth diapers? Do you you eat, breathe, walk, talk, and dream about cloth diapers? Don't be shy, we know how you feel - we've been there too! Not only that, we're accomplished enablers! We'll feed your hunger for cloth diapers and cloth diapering information, and won't stop until you're satisfied. Learn about cloth diapering by browsing the articles in our Information links. We're constantly adding to these resources so stop by often and see what's new. Discover in-depth information about our exclusive cloth diapering items by checking out the Products links in our menu. Everything you want to know about Zany Zebra products - and more. If you just want to chat about cloth diapering, feel free to contact us anytime - we love to talk cloth!